We’ve heard and seen much about North Melbourne and African refugee Majak Daw. Rookie listed by the Roos, Majak is continuing his footy apprenticeship with Werribee in the VFL. However, this week sees the AFL Under 18 National championships being held in Sydney at Blacktown Oval. And it’s Tasmania that has an interesting player in their squad - 17 year old Tour Miar, a lightly build (69 kg 195 cm) ruckman. Clubs from around England and Wales descended on Cardiff last Saturday for WARFL's British "Clwb" Challenge, now in its third year. It was a perfect day for footy with a sunny Saturday afternoon in the Welsh capital setting the scene for a great day of fast paced action which would be the first competitive football in Wales for 2010. The clubs this year fighting it out for the cup included last year’s winners Nottingham Scorpions, and the South Cardiff Panthers who were also the first ever Welsh club to enter a team into this tournament. They were joined by newcomers Birmingham Bears, Portsmouth Pirates and European powerhouse West London Wildcats. The Wildcats went into the tournament as certain favourites, with a squad of 16 that included only one non-Australian, which coincidentally enough was Welsh international Tom Cleary. This report courtesy of the WARFL. Two young South African footballers and an aspiring coach will come to Australia to hone their skills in AFL as part of the Geminder footyWILD Future Stars awards. The awards have been funded by the South African Honorary Consul in Victoria and will provide for two young players to fly to Australia to train as well as also spend time in an Australian school. A young coach will also be flown to Australia to further develop coaching tuition skills to be able to guide the very popular game in South Africa. Mr Geminder said "These awards will provide talented young South Africans with intensive AFL training, match practice, schooling and an idea of what can be achieved if they work and study hard. 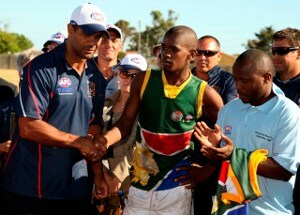 It is a great opportunity for me to team with the AFL and make a real difference in South Africa; football is uniquely Australian, uniquely Melbourne. It is a perfect fit for me as Honorary Consul for South Africa in Victoria, with football very close to my heart, to support these kids, and further develop alliances between Australia and South Africa". After many years of development in South Africa, Australian football there has produced its first international scholarship player, Bayanda Sobetwa, and today he is due to touch down in Sydney. Sobetwa, from Khayelitsha Township (south east of Cape Town), will play with Greater Western Sydney in Victoria's TAC Cup Under 18 competition (given dispensation since he is 19). GWS will be the 18th AFL club, entering the big time in 2012, one year after the Gold Coast. As part of his scholarship with Team GWS, Sobetwa will also undertake an AFL SportsReady Traineeship which will combine study and work in multicultural development in Western Sydney. Team GWS High Performance Manager Alan McConnell and some of Bayanda Sobetwa's new team-mates are expected to meet him at the airport to welcome the South African to Australia. No surprises from Cape Town in South Africa as the elite AIS-AFL Under 17 team of Australians taught the open-age South African Lions some lessons in their one-off match. It should be noted that the Aussies ran close to the Sydney Swans' reserves before departing Australia. Former Sydney Swans star Michael O’Loughlin, on his second visit to South Africa in 2010, coached the South African Lions team and was impressed with their willingness to learn. More details and photos of the match soon. South Africa Lions: Toy Prinsloo 2, Steven Malinga 1, Steven Matshane 1. Australia: Tom Mitchell, Daniel Gorringe, Adam Treloar, Michael Bussey, Piers Flanagan, Sam Gordon, Chad Wingard, Jonathon Patton. South Africa: Benjamin Motuba, Richard Prinsloo, Steven Matshane, Thabiso Phakedi, Bayanda Sobetwa. In February this year the Western Cape's Bayanda Sobetwa became the first South African to receive a scholarship to play in Australia for an extended period, with Kevin Sheedy's Team Greater Western Sydney offering him the opportunity of a lifetime. See Team GWS signs its first international player. Team GWS has assembled their initial squad for the new (future) Western Sydney AFL club, and played its first official game on Saturday in Victoria's TAC Cup Under 18 competition. So it begged the question - where is Bayanda? worldfootynews.com spoke with AFL South Africa's Joel Kelly. "Unfortunately there have been delays with Bayanda’s visa so he hasn’t left SA yet BUT that does allow him a final opportunity to represent South Africa on April 11 v AIS so he’s very excited about that..."
"He will be playing with Greater Western Sydney under Alan McConnell at TAC Cup U18 level this year with hope that he progresses well enough to stay on in 2011 and beyond". Team GWS look set for a tough year. Few of the squad are likely to make the final AFL list for 2012, with the new club guaranteed premium draft picks and pre-selections in the next two years. That may be just as well, as the club's first official hit out was a savage 94 point loss to TAC Cup side the Northern Knights, at Blacktown Olympic Park in Western Sydney. Hopefully that will mean Sobetwa gets plenty of opportunity to show his talents. 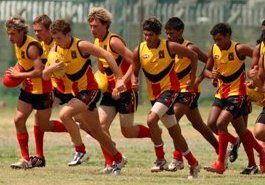 Once again the Australian Institute of Sport (AIS) - AFL Academy Squad, effectively Australia's Under 17 national side, will tour South Africa, conducting clinics and playing the South African Lions in Cape Town. Many of last year's squad have already made it on to AFL lists, indicating the tremendous talent in the team. The Lions will do well to be competitive, but it should be good preparation for the next International Cup. Players from both sides will also be keen to perform well in front of new Western Sydney coach Kevin Sheedy and his staff, with the Aussies hoping to be drafted or pre-selected by the new AFL club, and the South Africans hoping to follow in the footsteps of Bayanda Sobetwa, already signed to a scholarship with Western Sydney. Below is an AFL Press Release detailing the tour. The Flying Boomerangs, an Indigenous Australian team, have proven too strong for South Africa's Coastal squad, in the second and final game of their tour, in Cape Town. An even second half followed a dominant first, in which the large Nyanga township ground allowed the Australians to use their skills to damaging effect. Amongst the best for the locals was Bayanda Sobetwa. It was following this game that Boomerangs coach Michael O’Loughlin and AFL Commissioner Justice Linda Dessau announced an AFL SportsReady traineeship for Sobetwa which will see him join Greater Western Sydney (GWS) this year in the TAC Cup under AFL legend Kevin Sheedy. The AFL's Team Greater Western Sydney, set to enter the league in 2012, has made history by being the first AFL club to sign a player from the AFL South Africa. 19-year-old Bayanda Sobetwa has accepted a SportsReady traineeship, which will see him study and work in Sydney over the coming years, on top of his development as an elite footballer. GWS coach Kevin Sheedy, a long-time supporter of the internationalisation of Australian rules football, has compared Sobetwa to a young Michael Long. The following story appeared in today's edition of Sydney's Daily Telegraph newspaper.